Over the last few years, we have witnessed the emergence of new tools created by companies specializing in computer security. However, now according to the latest reports, recently, a mysterious company has claimed that it has developed new security tools to unlock any iPhone model. Over the last few years, we have witnessed the emergence of new tools created by companies specializing in computer security. They work in partnership with governments and have as mission to unlock any iPhone using brute force techniques. This week, a somewhat mysterious startup, called Grayshift, has announced that it has leading-edge software capable of unlocking any iPhone. Over the years, the tech giant Apple has proven to be a company that values the safety and privacy of users of its products. However, the threats to which the devices are exposed make the work of the Apple brand quite complicated due to the increasingly sophisticated methods that try to penetrate the layers of applied security. In recent weeks, Grayshift has unveiled its tool to unlock the tech giant Apple’s smartphones between the police community and other private security companies. The tool is called GrayKeyand there are two versions available for purchase. The cheapest version costs $15,000, can be used 300 times and requires a constant connection to the Internet. On the other hand, there is an unlimited version, which does not require an Internet connection and can be purchased for $30,000. However, both versions have a 1-year usage license. In addition, a recent announcement that Forbes acquired, taken from a private Google group, is advertising what the GrayKey tool is already capable of and how it will evolve over time. For now, the company Grayshift says to be able to unlock any iPhone that is using versions 10 and 11 of iOS and will soon be able to unlock any iPhone running iOS 9. This announcement is also devices where the unlock software can be applied. Till to the date, all iPhones from the 5s to the latest iPhones 8 and 8 Plus and iPhone X have been included, but with iPhone 5 and 5c coming soon. What kind of vulnerabilities are there? Apparently, Grayshift uses a hacking technique that attacks the Secure Enclave of iPhones. This is the chip of the iPhones that is isolated and that is responsible for saving the encryption keys. A strong point of the Secure Enclave developed by the tech giant Apple is that it takes a long time for brute force attacks, increasing the wait time to one hour from the ninth failed attempt. But by enabling you to disable and override the Secure Enclave, you can shorten the time between attempts. Several sources tried to contact the Cupertino company for comment, but the tech giant Apple declined to comment. As usual, it recommends that all users take advantage of regular updates to keep iPhone with the latest version of the operating system, which usually includes security fixes. Fortunately, there is a situation that the tech giant Apple can take advantage of. Grayshift’s business model is proving to be different from other companies offering similar services. 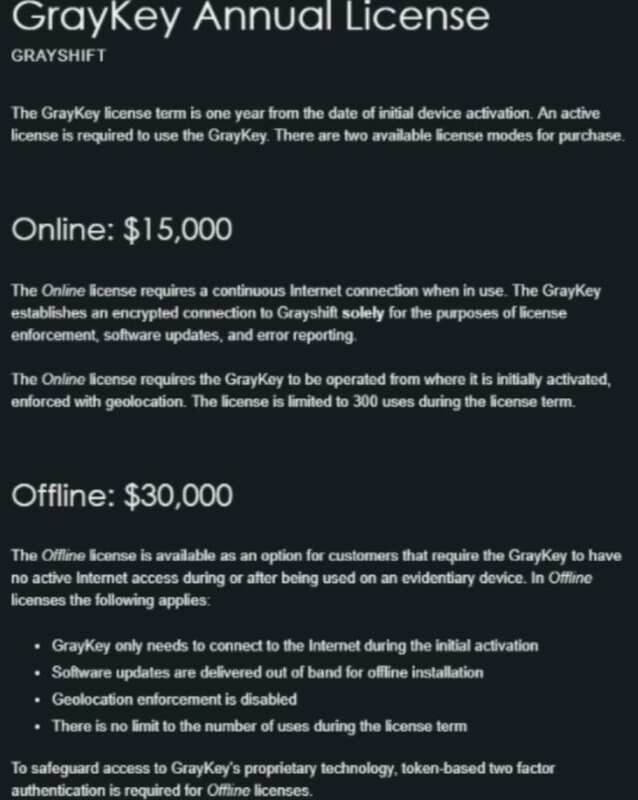 While the vast majority of companies of this type are asking security companies to ship the devices, Grayshift is selling the software. This should allow Apple to acquire a copy and be able to determine which vulnerability is being exploited. If by chance, the tech giant Apple is not doing so, there will certainly be someone around the world a security expert who should be able to examine the operation of this software. And reporting the bug to the tech giant Apple and will be able to earn between $100,000 and $200,000. Not much is known about the company itself, but there are already names. Grayshift is being led by people who worked directly with the US security agency and a former computer security engineer who worked at Apple. According to profiles on LinkedIn, the company was founded in 2016 by David Miles, who worked at Endgame and who developed hacking tools for the NSA and other US security agencies. The company was founded following the war between the FBI and Apple, in which the FBI wanted Apple to unlock the terrorist’s iPhone; but the Cupertino company protested. The FBI eventually paid $1 million to an unknown specialist to get into the device and retrieve the information. The tech giant Apple is very serious about the safety of its iPhones and wants to protect its devices and users at all costs from its products. Currently, smartphones have banking information, private conversations, photographs and even health information that we do not want anyone to have access to. However, the development of this type of software that can be bought and used by someone with the right knowledge is putting the safety of iPhones at risk.